Earth Sciences are going through an interesting phase as the traditional disciplinary boundaries are collapsing. Disciplines or sub-disciplines that have been traditionally separated in the past have started interacting more closely, and some new fields have emerged at their interfaces. Disciplinary boundaries between geology, geophysics and geochemistry have become more transparent during the last ten years. Geodesy has developed close interactions with geophysics and geology (tectonics). Specialized research fields, which have been important in development of fundamental expertise, are being interfaced in solving common problems. In Earth Sciences the term System Earth and, correspondingly, Earth System Science have become overall common denominators. Of this full System Earth, Solid Earth Sciences – predominantly addressing the Inner Earth - constitute a major component, whereas others focus on the Oceans, the Atmosphere, and their interaction. This integrated nature in Solid Earth Sciences can be recognized clearly in the field of Geodynamics. The broad research field of Geodynamics builds on contributions from a wide variety of Earth Science disciplines, encompassing geophysics, geology, geochemistry, and geodesy. Continuing theoretical and numerical advances in seismological methods, new developments in computational science, inverse modelling, and space geodetic methods directed to solid Earth problems, new analytical and experimental methods in geochemistry, geology and materials science have contributed to the investigation of challenging problems in geodynamics. Among these problems are the high-resolution 3D structure and composition of the Earth’s interior, the thermal evolution of the Earth on a planetary scale, mantle convection, deformation and dynamics of the lithosphere (including orogeny and basin formation), and landscape evolution through tectonic and surface processes. A characteristic aspect of geodynamic processes is the wide range of spatial and temporal scales involved. An integrated approach to the investigation of geodynamic problems is required to link these scales by incorporating their interactions. In order to contribute to these new developments, Springer is providing a new platform as a publication outlet. This new book series has been created to provide a broader and integrated scope by merging several existing, more specialized book series*. 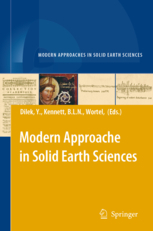 The new series, entitled "Modern Approaches in Solid Earth Sciences" is a timely response to the above described trend and is aimed at providing a contemporary outlet for innovative integration of disciplinary approaches to problems and processes in Solid Earth Sciences.